Design for Industrial communications applications, Data Connect’s EM202T-OEM embedded leased line modem module offers compact size and high performance for point-to-point and point-to-multipoint networks operating up to 9600bps. The serial interface with TTL level is designed to interface with any system controllers and no special device driver required. 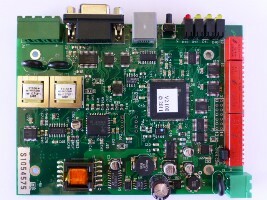 The EM202T-OEM embedded module is a complete modem ready to integrate into any host system. The easy to use serial interface drastically reduces development time and cost for system designers. The compact size and low power consumption makes it ideal for any systems with communications requirements. Single +5v power requirement, max.75 mA.